Australian Water Parks – Since its introduction in the late ‘40s and early ‘50s, the popularity of water parks has grown enormously. This type of amusement park focuses on the different ways of utilizing water to bring fun and entertainment for the whole family, especially the young ones. Its main features in the water play areas are lazy rivers; spray grounds; splash pads; water slides; plus bathing and swimming activities. Australian Water Parks are favorite destinations for the family and fun-lovers during weekends and holidays. While the northern hemisphere suffers from snow storms and cold, bitter weather, the summer heat is taking its toll in Australia. At this time of the year, it’s better to forget about city sightseeing in Sydney and cool off in the water instead. But Australia doesn’t just offer miles of sandy beaches, it has heaps of awesome water parks definitely worth seeking out. So, why not take the kids to one of Australia’s top water parks and enjoy a family day out – experience the thrill of fast water slides, try surfing at the giant wave pool or relax and unwind as you sail along one of the gentle lagoons. Situated in the suburb of Coomera on Gold Coast, Australia, WhiteWater World was opened to the public on December 08, 2006. It is owned and operated by Ardent Leisure that cares about the environment so they designed the efficient use of water in the Park. Its theme attractions cost a cool sum of approximately $56 million that included: Cave of Waves; Pipeline Plunge; Super Tubes Hydrocoaster; The BRO; The Green Room; The Rip; Temple of Huey; and Wiggle Bay. Four water slides were added: two called Little Rippers, one The Wedgie and one The Triple Vortex. Since its opening, thousands of visitors declared that the park has met over and above their expectations. Ardent Leisure, who is co-located with Dreamworld, introduced its latest slide, the Triple Vortex. More are expected as it has submitted a development application for the expansion of the water park and plans to add five new attractions. Not just an ordinary water park, WhiteWater World features ground breaking technology to deliver some serious splash. One of the biggest and most extreme water slides in Australia is found in Gold Coast Wet’n’Wild Park. Located in Oxenford, Wet’n’Wild Park is owned and managed by the Village Roadshow Theme Parks. The park opened on the September 30, 1984 under the name of Cade’s County Waterpark. But in 1987, it was changed to simply Wet’n’Wild after a licensing agreement was reached with the chain of Wet ‘n Wild water parks overseas. In 2013, the park’s name was finally changed to Wet’n’Wild Gold Coast in order to differentiate the park from Wet’n’Wild Sydney. Since its opening, the park has entertained millions of visitors and it is No.1 in Australia Waterparks and No. 8 among waterparks worldwide. The Extreme H2O Zone latest attraction features are: a funnel slide, an enclosed and open tube slides and a large body slide complex. Kamikaze is a two U-shaped half pipe slides that are kept wet to reduce friction. Two riders are seated inwards facing the tubes. They are send down a steep slope before it returns at the other side in a boomerang-like fashion until they run out of speed and momentum. Tornado sits four-person in a clover-leaf slide funnel. It drops down and then it turns before plunging in a steep incline towards the funnel below as its goes down very fast with a speed of about 40 km/h. Blackhole is a two-enclosed tube slides that twists and turns around each other. Riders are immersed in complete darkness as they traverse down the slide reaching high speeds. Mach 5 is a large water slide complex. It is divided up among five different slides: sidewinders are two open flume slides that twist down to the bottom around the outside of the complex; the Jet streams are three high speed body slides; and the central slide is a free fall to the splashdown area The outer two are similar, but it traverses down the slope twisting in a snake-like fashion. So many other WetnWide Water attractions are available that a whole day is inadequate to try them all. Adventure World theme park is located in Bibra Lake, Perth, Western Australia. Business started on November 11, 1982 with the “Adventure World of Edgley’” as main attraction. The park changed hands from Omni Leisure Operations in 1999 to West Australian, Steve Sicerich, in 2000 who now owns the park. Fighter roller coaster is the single largest investment in the park’s history. In the magical medieval kingdom lives the Lovable Dragon, Yarli with his younger sibling Yarlotte, grandpa Yarold and their fairy friend Flossy. The land has many other interesting figures. A space shot ride built on the old Turbo Mountain site. The largest water playground of its kind in Australia. Paddle the paddle boats and have fun. A long way to go on a tube slide. A high chairlift but it does not reach the sky. You play a laser battle for salvation minus the original Terminator. A train game is always interesting. 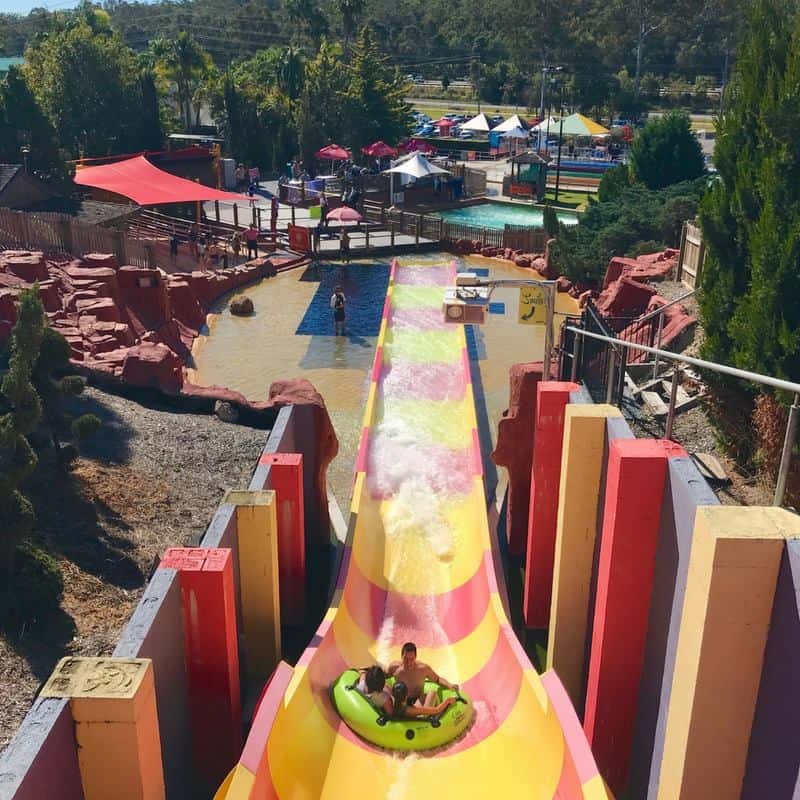 You will enjoy hours of excitement and thrills in Perth’s premier amusement park –ADVENTURE WORLD, with over 30 thrill rides and water slides, including Kids Cove with some more attractions. Adventure Park is the first water park in Victoria and located in Wallington near Geelong. The park contains many attractions such as numerous water slides and water playgrounds. Rides include: Bonito’s Bay waterplay, Carousel, Jumping Jets, Rapid Rider waterslide, River Torrent Lazy Rider, Six-Lane Aqua Racer Tiny Tot Splash zone and Tunnel of Terror. So much more attractions await every visitor. Come to Water Park in Geelong anytime to find some of the most fun and exciting rides in Victoria! Treat your family and loved ones to a whole day of fun and adventure! The best option to keep cool under the hot Gold Coast sun is to spend time in this family-friendly place that everyone will love. The Sea World Resort Water Park has a large water slide that will keep the whole family entertained; while the kids are enjoying themselves in a shallow kid’s pool with its own mini water slides and water fountains. 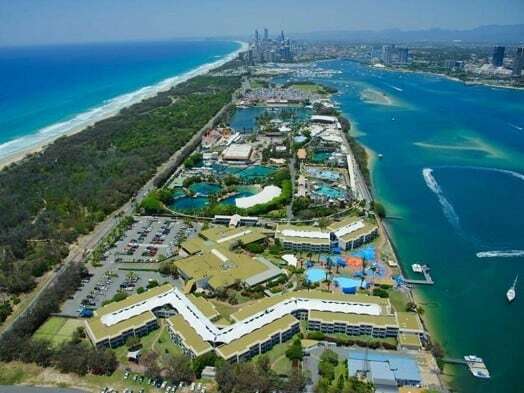 Sea World Resort & Water is the perfect getaway while on the Gold Coast. The resort is family-friendly where you and your kids can bond and cool off at the aquatic playground of SpongeBob Splash Bash or watch the sharks, pet the seals and dolphins at the Animal Adventures. You can also enjoy the slides and pools at the Water Park while the kids meet their favorite Nickelodeon characters on site. For privacy, you can hire one of the trendy cabanas on the poolside complemented by its own private shaded enclosure including amenities as: a couple of lounge chairs, a comfortable sofa, towels, magazines, and free use of refrigeration and television. This is perfect place to unwind while the kids splash about in the sun. If you check in at Sea World Resort, you can enjoy free unlimited use of the Water Park for the duration of your stay, and if you’re a visitor to Sea World, you can upgrade your pass to include free use of the Resort’s Water Park facilities. As guests at Sea World Resort, you will have unlimited access to the Water Play aqua playground in the main pool area. Other activities include the SpongeBob SplashBash and evening light show. Jamberoo Action Park is a theme and water park found at Jamberoo, NSW. In early ‘80s, the Eddy family embarked on the creation of a recreation park to contain amenities as building, restaurant, carpark and, the all-important, the chairlift. The primary construction of the Jamberoo Park was finalized in time for the Australia’s 1980 Titles for Grass Ski. Eddy and family did their thing in developing a water park. In 2006, they changed the name from “Jamberoo Recreation Park” to “Jamberoo Action Park”. The final thrill ride in the previous master plan development opened in Sept. 2007. Funnel Web that was the longest, biggest and most invigorating water thrill ride of its kind. Completed in December 2012 was the Clover leaf raft that loops and twists down the hill before dropping into the huge funnel and shooting out into the splash pool. Banjo’s Billabong is an Interactive Play Area that is five times the size of the current Billabong Beach play area. Behemoth Bowl for riders to whirl around in spiral inside the huge bowl before plunging into the pool. Due to the length of the Giant Rapid, it is connected to all the rides in the Kangaroo Island Area. When you finish a water slide, you will easily get straight into the river and find your way around to enjoy more rides. The Rocket is a coaster that employs the maglev technology to push people along the tube and up the hill. Due to hectic lifestyle today, a quiet and peaceful venue is needed where you can relax, rest, enjoy and wash off stresses and anxieties that are part and parcel of your daily survival. Australian Water Parks are just the right prescription to attain the peace & quiet to balance the turbulence of this world. These looks wonderful places to feel the summer heat. Hope to get to visit these places soon. I live here and haven’t been to any of them ;( Pretty sad!